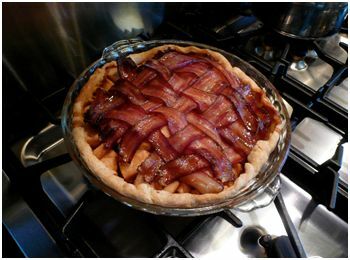 Bacon Apple Pie Recipe. Why in the world haven’t we ALWAYS eaten this? This is a repost from 2008, as it was just featured on the Food Network, which has generated lots of traffic today. Chef Jenn Louis has been recognized as a semifinalist for the 2010 and 2011 James Beard Foundation’s “Best Chef Northwest,” and in 2012 was named Food & Wine’s “Best New Chef” for the Northwest region. She has made appearances on ABC’s The Chew, and her work has been featured in The Wall Street Journal, Food & Wine, Bon Appetit and The New York Times. She has appeared on Top Chef Masters, and in 2016 her bacon apple pie was featured on the Food Network’s Guilty Pleasures. In 2015, Jenn released her cookbook Pasta by Hand: A Collection of Italy’s Regional Hand-Shaped Pasta. In 2008 Jenn Louis honored us with this bacon apple pie recipe. It tastes as good as it looks. On a lightly floured work surface, roll out one pate sucree disc into a 13-inch round about 1/8 inch thick. Fit dough into a 9-inch pie plate. 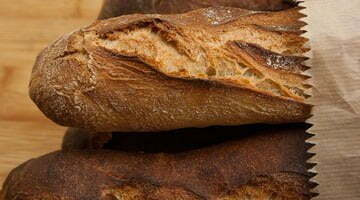 With a sharp paring knife, trim dough about ¾ inch over the rim. Turn rim of pie dough under to form a runstic crust. Freeze again until firm, at least 30 minutes. In a large bowl, toss the apples with the lemon juice, granulated sugar, flour, cinnamon, nutmeg, and salt. 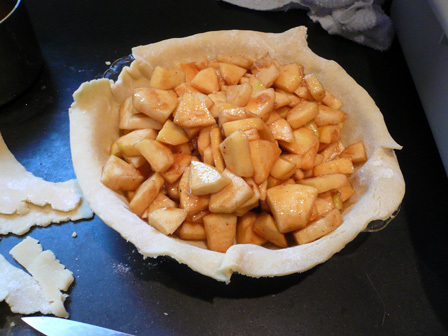 Remove pie shell from freezer, and fill with apple mixture. Dot with butter. Arrange the strips of bacon over the top of the piecrust in a lattice, then fold the edges of the pie crust over the bacon and crimp. Bake for about an hour, until the bacon on top is nicely crisp, the crust is browned and a knife pushes easily into an apple slice. This should be about an hour. Every apple has a different water content and will react to cooking differently. So, just pierce with a knife to make sure the apples are soft and the bacon is crisp! Lightly beat yolks and water in a small bowl until combined. Pulse flour, sugar, and a pinch of salt in a food processor until combined. Add butter, and process until mixture resembles coarse meal, about 20 seconds. With the machine running, add yolk mixture in a slow, steady stream. Process until mixture just begins to hold together (no longer than 30 seconds). Shape dough into 1 disk, and wrap in plastic. Refrigerate until firm, 30 minutes to overnight. Category: Food Writing, Portland Food and Restaurant News and Discussion, Recipes. Related posts about Lincoln Restaurant. More about Jenn Louis. This is a delicious recipe, but I have one hint. Wait until you’ve finished the bacon lattice on the top of the pie before rolling the rim. I tucked the bacon under the rim of the crust, then pinched the rim as usual, It kept the bacon from shrinking and pulling away from the rim during baking. I also used thick-cut bacon for the lattice. OMG! I can’t believe they’re not open tonight! I want to give this a try, but I can’t find any reference to it on Lincoln’s website, or either of the blogs cited. Wow! I’m thinking that this might be kind of tough to eat, though. You’d probably need a knife to get through the lattice. I’d love to try it with the bacon cut up into little pieces and mixed in with the apples. A nice, evenly cooked bacon lattice is the food equivalent of a rainbow or Natalie Portman. Because I’m such a trooper, I volunteer to stop by Lincoln, eat dinner, and have the pie. I have to think of the right wine, of course. Am I the only one who finds this completely unappetizing? I like bacon just as much as the next fellow, but this is absurd as far as I’m concerned. I saw this and had to give it a shout out on KGW’s Live @ 7 tonight. The newsroom really did go nuts over it, and FWIW, I’m in the camp that thinks it’s the greatest thing ever, and I’m going to attempt one tonight for the newsroom potluck tomorrow. I’m trying to figure out whether the pie is par-baked before the lattice goes on, or if the bacon goes in the oven for 45 minutes. weknowpinot, you made me laugh. Thanks! Although don’t find the idea of bacon and apples unappetizing, based on the photos, the raw bacon cooks off at the same time as the pie, which means that rendered bacon fat is soaking into the pie as it cooks; this I do find unappetizing. As another poster mentioned, mixing cooked bacon in with the apples prior to baking sounds considerably better. I might also add that a nice slice of sharp cheddar on top would really sell it! No thanks – that look nasty. Poor pig that gave its life for that. Dessert for after my Reggie Deluxe at Pine State!!! oh my gawd. i want me one. What if the lattice was pre cooked, perhaps in a roasting pan in the oven. That would pull the oil content of the pie down to acceptable tolerances, insure both sides of the bacon were cooked, while still allowing you to mix the crunchy bacon goodness with apple cinnamon nirvana. I don’t know about dessert, but this is definitely my kind of breakfast!! I’m sure Jenn figured this out long before I did, but there’s no pre-cooking or par-baking needed. 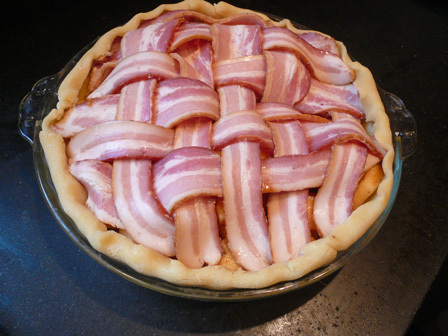 A lattice of thick-cut bacon cooks perfectly along with the pie for about 75-80 minutes at 375 degrees. You do need to plan for quite a bit of shrinkage, so don’t trim the bacon as you lay it down. The bacon fat did make the pie filling a bit more liquid than I’d expected — next time I won’t drizzle any remaining liquid from the bowl into the pie. It wasn’t overly runny once it cooled, though, and the bacon drippings end up giving the apples an amazing creamy texture that’s unlike any apple pie you’ve ever had. I made this last night, using the Betty Crocker recipe circa 1978, 50 minutes at 425F. The bacon came out a little overly browned, but was still quite tasty. Sure, the bacon adds quite a bit of fat, but come on, any time you bake a normal apple pie, you always dot it with butter before putting that top crust on (don’t you? You should!). I trimmed my bacon so it overhung the dish by about 1/4 inch and then tucked the ends between the crust and apples, and didn’t experience any noticable shrinkage. It is somewhat difficult to cut the bacon, so I think next time I try this (there will be a next time), I’ll do a mock lattice, cutting shorter lengths of bacon and arranging them to look weaved, instead of actually weaving full strips, that should solve that problem. I didn’t find mine overly liquidy, but then, I like a somewhat gooey pie. My particular recipe does call for 1/4 cup flour in with the apples, so that amount of thickener likely helped the liquid situation, as well. @Jenn: thanks so much for following up with some cooking tips. I can’t wait to give this a try, either at the restaurant or at home. Redefines the whole concept of Pie for breakfast! Ok, I went to Lincoln and tried the pie. 1. It comes in a two person serving; a fairly big dish with a large scoop of ice cream on top. 3. Half way through, I was thinking, yes, it is interesting, but I don’t think I’d order it again. 4. The problem is, it’s just too heavy, especially after just finishing a large dinner. 5. All in all, I enjoyed the pie and am glad I ordered it, but I don’t know if I would want it more than once a year. I think they are going to have it available on Friday & Saturday nights until it runs out. Sounds to me like the only problem is that it’s being served as a dessert. That looks kinda breakfasty to me right there. And awesome in so many ways. Ice cream might be a bit much, but then, I don’t often like ice cream on pie anyway. Actually, the maple ice cream is absolutely necessary. The dairy does something to cut the fat, and of course the combo of maple/bacon/apple is a winner! This recipe omits the streusel that was shown on Food Network recently. I guess Chef Louis doesn’t share complete recipes. Disappointing. That’s the one I am looking for too! With the strudel in the bottom and on top before the bacon lattice is added.